Notes of Sparkling Brut Champagne with Sweet Peaches. 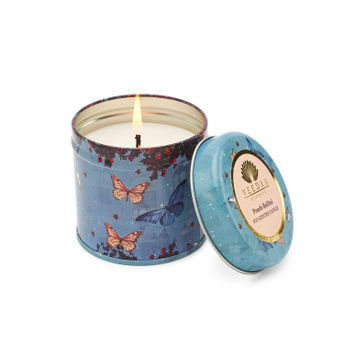 Scented candle contains our proprietary wax blend of Soy, Vegetable and Soft waxes with our incredible fragrances. The product comes with a free gift bag. Care Instructions: On the First Burn ensure hot melted wax pool reaches the edge of the container before extinguishing wicks. Make sure to trim wicks to 1/4 inch before each relighting. Keep out of reach of children and pets. Explore the entire range of Candles and Diffusers available on Nykaa. Shop more Veedaa Candles products here.You can browse through the complete world of Veedaa Candles Candles and Diffusers .